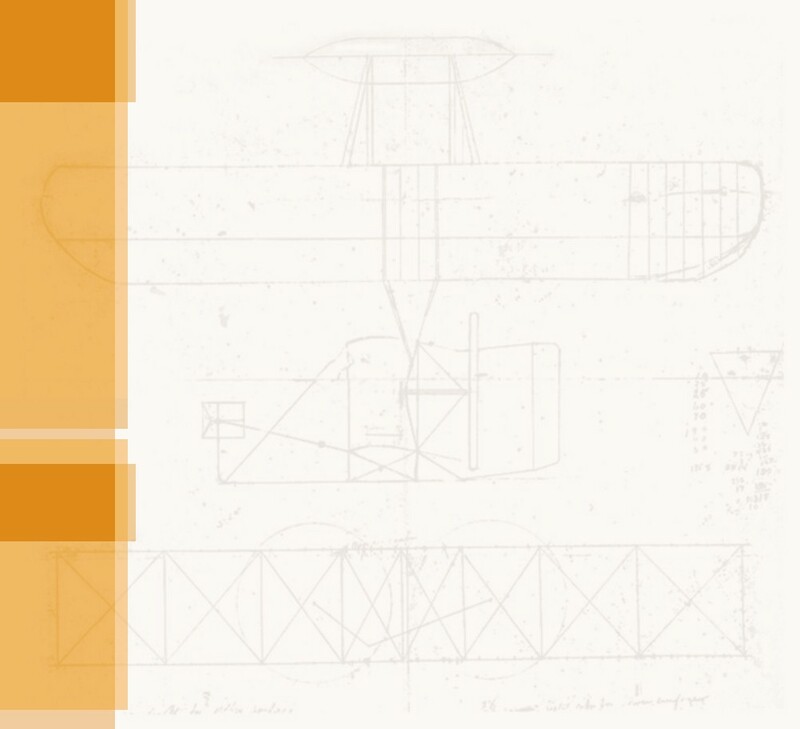 istorians who study the Wright Brothers are often amazed and chagrined that they are best remembered for the one day when they stepped out of character and made the most risky gamble of their careers. For four short flights -- after the last of which they wrecked their airplane and nearly killed a man -- these prudent, sober, intelligent men literally threw their considerable caution to the wind. On the evening of December 16, there was an ominous black line of clouds on the horizon. This front advanced quickly and the bane of the east coast, a noreaster, laid siege to the Wright brothers camp at Kitty Hawk, North Carolina. The rain abated by morning, leaving puddles of ice between the sand dunes. The wind, however, continued to blow in from the ocean, gusting to a fierce 30 miles an hour and creating a chill factor of 4 degrees. 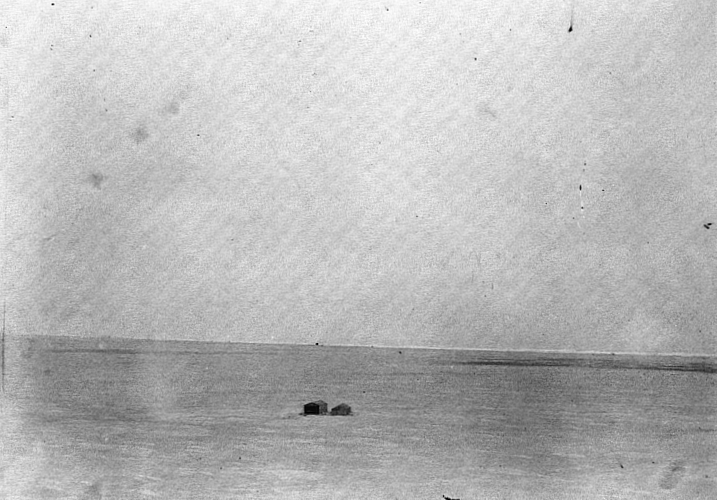 Lying fully exposed on the lower wing of their biplane, Wilbur and Orville must have known the wind would toss them like a feather and cut them like knives. "What do you think, Will?" "Its blowing awfully hard, Orv." "Maybe it will die down by this afternoon. Or tomorrow morning." "Theres no guarantee the weather will get any better. Fact is, the longer we stay at Kitty Hawk, the worse it will get." "And if we dont leave soon, we wont get back to Dayton for Christmas." And there you have it. The Wright brothers had the first recorded case of get-home-itis, a potentially fatal malady that afflicts every pilot who ever flew. Get-home-itis is a broken gear in your head that engages whenever you really want to go somewhere. It kicks into overdrive when the weather or the aircraft presents a challenge to your piloting skills. Hundreds of thousands of light-plane pilots have flown to an early grave because they couldnt disengage and do the smart thing: Stay on the ground. But the Wrights ignored this sober course for the same reason they ignored the icy, gusting winds of the noreaster. They wanted to get home for Christmas. A little past ten in the morning, they took a gamble and nailed a red blanket to the side of their hangar, a pre-arranged signal to tell the Kitty Hawk Life Saving Crew that they needed help getting the aircraft ready to fly. 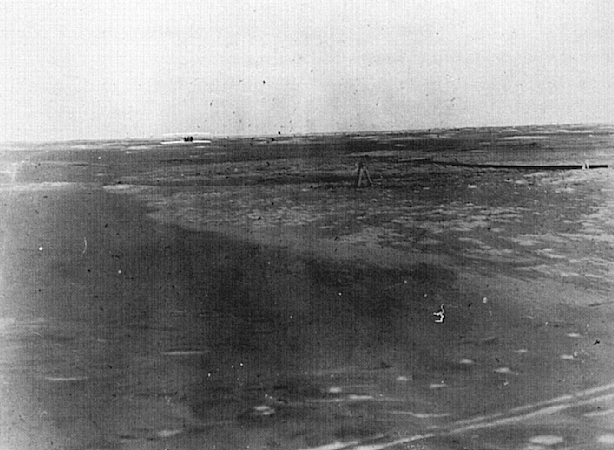 While the Wrights waited, they began laying out the wooden track about 200 feet from the hanger. Now occurs the first miracle of the day, and the one that is most often overlooked. Five men -- John Daniels, Adam Etheridge, Will Dough, W.C. Brinkley and Johnny Moore -- left a cozy station and a warm fire to go to work in the icy, biting wind and help two eccentric Yankees drag a 600-pound contraption across the frozen sand. If you don't think this is a miracle, the next time you're at Kitty Hawk on a cold winter's day, call the Coast Guard and tell them you need help moving your perpetual motion machine out to the beach. It's a safe bet they'll make excuses. Nonetheless, Daniels, Etheridge, Dough, Brinkley, and Moore did not make excuses, and the world is indebted to them for it. There ought to be a monument to them somewhere in Kitty Hawk to remind us that there is no such thing as an unimportant act of kindness. 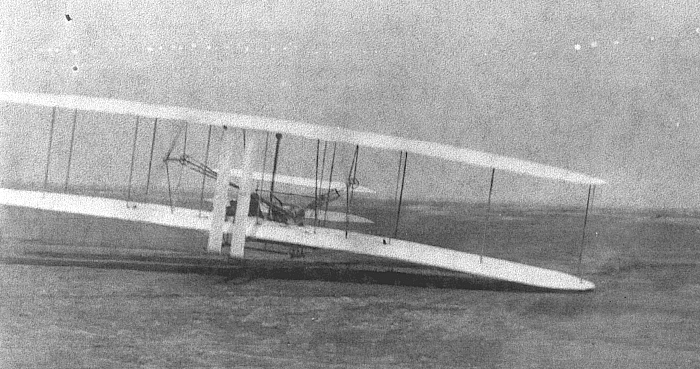 By 10:30 AM, the Wrights and their crew had the Flyer positioned on its launching rail. Wilbur and Orville pulled the propellers, and the engine coughed and sputtered as it awoke. While the motor was warming up, the brothers stepped aside for a moment by themselves. "We couldn't help notice how they held on to each other's hands, sort of like two folks parting who weren't sure they'd ever see one another again," said one of the life saving crew. It was Orville's turn to fly, and he took his position on the Flyer. He instinctively did what every good pilot since has done just before take-off -- he checked his controls, moving the elevator, warping the wings, and turning the rudder. 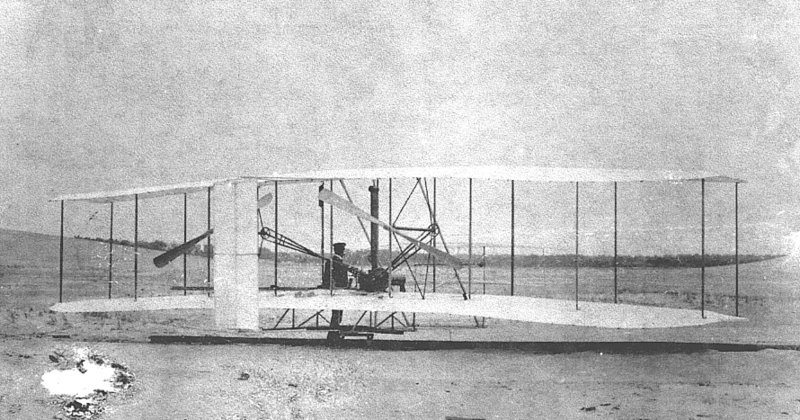 While Orville was doing this, Wilbur enlisted Daniels to snap a photo just as the Flyer reached the end of the rail. He also requested for the crew "not to look too sad, but to...laugh and holler and clap...to try to cheer Orville up when he started." The air was heavy with history, and Wilbur was trying to lighten the somber mood. About 10:35, Orville loosed the restraining wire, and the machine began to move down the rail into a bitter wind that was now gusting to 27 miles per hour. Wilbur ran along side. Two thirds of the way down the rail, the Flyer lifted into the air and the crew cheered. Like Wilbur three days before, Orville underestimated the effectiveness of the elevator, and the machine rose quickly. Just as quickly, Orville threw the elevator down and the machine dived. Up again, down again for a breathtaking 12 seconds, and the Flyer landed -- pilot and airplane intact except for one cracked skid -- 120 feet from the end of the rail. For the first time ever, a flying machine had taken off from level ground, traveled through the air, and landed under the control of its pilot. It was a wavering, unsteady control to be sure, but it was control just the same. Orville and Wilbur were elated -- but not satisfied. About 11:20 AM they made a second flight with Wilbur at the controls, this time covering 175 feet. 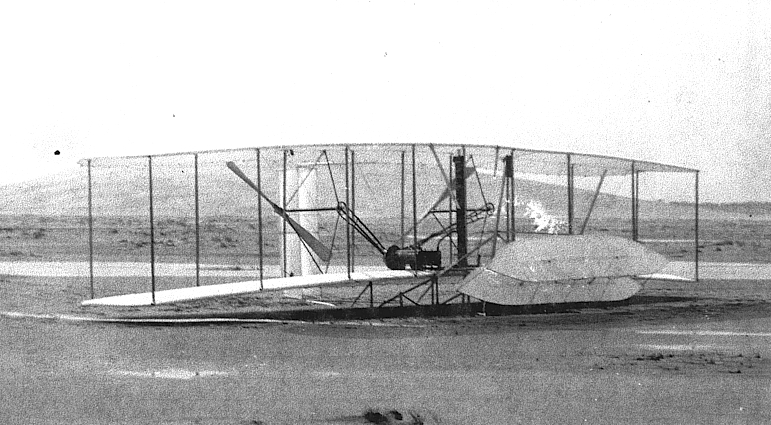 Twenty minutes later, Orville flew for a third time and landing 200 feet from the starting point. Finally at 12:00 noon, Wilbur took off for a fourth time. The beginning of the flight was about like the first three. The Flyer pitched a fit as the pilot fought to control the elevator. 100 feet out and the aircraft was bucking up and down like a rodeo bull. At 200 feet, it was worse. But after about 300 feet, Wilbur finally got a feel for the elevator and the Flyer's path began to smooth out. He had passed the 800 foot mark when a gust of wind caught him and the airplane began its wild gyrations again. Wilbur fought it for a few seconds, trying to regain control, when the Flyer "suddenly darted for the ground," as Orville later described it. It landed 852 feet and 59 seconds from its starting point, snapping the elevator support but otherwise unharmed. Wilbur and Orville were satisfied. The Flyer flew. While carrying the airplane back to the launching point, the men discussed the possibility of repairing the elevator and making a long flight -- maybe all the way to Kitty Hawk, four miles away. Just as they put the machine down to take a rest, a sudden gust of wind picked up one wing. Daniels jumped to grab a strut and was caught in the bracing wires as the machine rolled over and over again. When it came to rest, it was nothing but kindling wood and torn cloth. But the day was rife with miracles, and Daniels escaped without a scratch. The Wright Flyer was not so fortunate. The world's first true airplane would never fly again. It was yet another miracle that it had even flown at all. Much later, aeronautical engineers would analyze its flight characteristics and discover that the overly sensitive elevator made it nearly uncontrollable. A computer simulation by Fred Hooven showed that a pilot needed the reflexes of a professional athlete to keep the Flyer in the air. By all accounts, the Wright brothers were superb pilots, but with less than a minute at the controls of a strange new machine, could they have been that good? Charles Lindbergh, who flew the Atlantic in 1927, gives another explanation in his Autobiography of Values. "There are elements in man that escape rational description, that lie beyond the measurements of science. They may exist at distance beyond the body, yet still exert an influence within. " Those first few flights were where physics and faith, engineering and poetry all came together. It was the Wright brothers' time and they rose to the occasion. Johnny Moore cried the news to the folks of Kitty Hawk, running to the village shouting, "They done it! They done it! Damned if they ain't flew." The Wrights themselves were more sedate and in better possession of their grammar. They ate a quiet lunch, then walked to the Kitty Hawk Weather Bureau to send a telegram home to Dayton. "SUCCESS FOUR FLIGHTS THURSDAY MORNING ALL AGAINST TWENTY ONE MILE WIND STARTED FROM LEVEL WITH ENGINE POWER ALONE AVERAGE SPEED THROUGH AIR THIRTY ONE MILES LONGEST 57 SECONDS INFORM PRESS HOME CHRISTMAS. OREVELLE WRIGHT"
Bishop Milton Wright received the telegram at 7 Hawthorne Street about 5:30 PM, and showed it o Katharine a few minutes later. Supper was delayed while the telegram was sent over to Lorin's home and the news was telegraphed to Octave Chanute. Orville's high school chum , Paul Laurence Dunbar, had by this time come back to Dayton. The celebrated poet was resting and trying to beat the tuberculosis that was consuming him. Several unconfirmed accounts record that Paul stopped by 7 Hawthorne Street not long after the telegram arrived and the Bishop showed it to him. Dunbar's visit is probably apocryphal. However, it seems fitting that among the first people to learn of the flights there would be a minister and a poet, for that was exactly what mankind needed at that moment. Looking back, we now know that the airplane was more than an invention, and those first flights more than a get-home gamble. They were a metaphysical coup-de-tat, a revolution in thought so vast that we are still sorting out the pieces a century later. Prior to December 17, 1903, the view that most folks had of their world was two-dimensional, neatly organized and partitioned like an overgrown checkerboard. Our great grandsires traveled from fence to fence and boundary to boundary, always knowing where they were. After that day in 1903, our lives became increasingly three-dimensional, the landscape vast and interconnected. The comfortable divisions by which we made sense of our world vanished like a mirage, as did the old landmarks by which we steered our course. Wouldn't you give your eye teeth to know what sermon Bishop Milton Wright preached on the next Sunday, or what poem Paul Laurence Dunbar penned after he had learned of his friends' success? They must have sensed that the world was about to be turned on its ear. What balm did they offer to deal with the wonder and terror of seeing the world from a height once reserved for angels? Did they have sage words to replace the ancient wisdom that had been swept away in the Flyers propeller wash? Or did they simply speculate on the wisdom and whimsy of a Deity who neglected to give us wings yet obviously intended for man to fly? A view of the 1903 Wright camp from Kill Devil Hill. Wilbur getting the Flyer ready for flight. 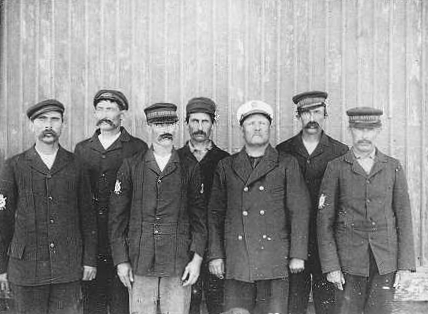 The Lifesaving Squad at Kitty Hawk. Orville checks over the Flyer before takeoff. The photo that John Daniels took at the beginning of the first flight. This is the complete print -- the chip on the lower left corner is often cropped out. The Flyer almost 800 feet out from the launching rail, just before the end of the fourth flight. The telegram that the Wright brothers sent to their father, Bishop Milton Wright, to inform them of their success. 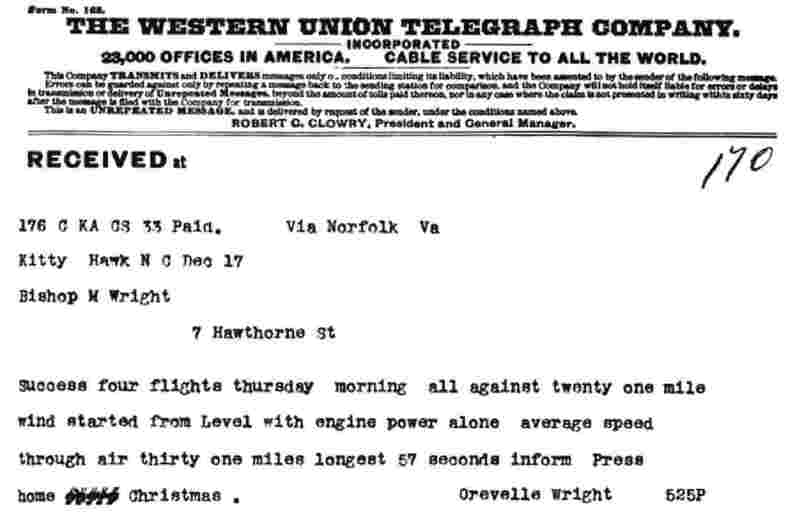 Orville Wright's Diary: December 17, 1903 – How Orville Wright summed up the day's events. Virginia Pilot Story: December 18, 1903 – How The Virginia Pilot newspaper presented the story of man's first successful flight to the world at large.